A cooperation between 15 partner nations and five space agencies, this 420 metric ton, football field-sized complex orbits Earth at an altitude of 400 kilometers every 90 minutes at 28,000 kph. It consists of 15 major pressurized modules with a combined pressurized volume of 932 cubic meters—equal to that of a Boeing 747! Gerst is part of the three-person Expedition 57 crew. His two crewmates are Russian cosmonaut Sergey Prokopyev and NASA astronaut Serena Aunon-Chancellor. Over the last two decades, the outpost has hosted hundreds of people from 18 different countries to perform thousands of experiments in physics, biology, medicine, life sciences, metallurgy, remote sensing and genetics, just to name several, for the benefit of the whole world. NASA and other space agencies are even using the outpost to research how to enable humanity’s reach to expand to deep space destinations such as the Moon and Mars. It took dozens of flights using NASA’s Space Shuttle as well as several Proton and Soyuz rockets from Russia to build this amazing complex over 13 years with assembly complete declared in spring of 2011. But this feat of human achievement had to begin with a first step, and that was with the launch of the first module on Nov. 20, 1998—the Zarya functional cargo block. Meaning “sunrise” or “dawn” in Russian, Zarya provided the fledgling space station with its first bit of power, storage and propulsion. The module itself is 12.6 meters long and 4.1 meters wide with a mass of 19,300 kilograms. It has two solar panels with a full wingspan of 10.7 meters, which helped provide power for the first several years of the stations existence before larger panels began taking on a larger share of power production. These have since been retracted to make room to deploy radiators on the stations vast integrated truss structure. With three docking ports, it is currently the connecting point for three major modules: at its forward is Unity via Pressurized Mating Adapter 1, at its aft is the Zvezda service module, and at its nadir is Rassvet. These would be attached in 1998, 2000 and 2010 respectively. 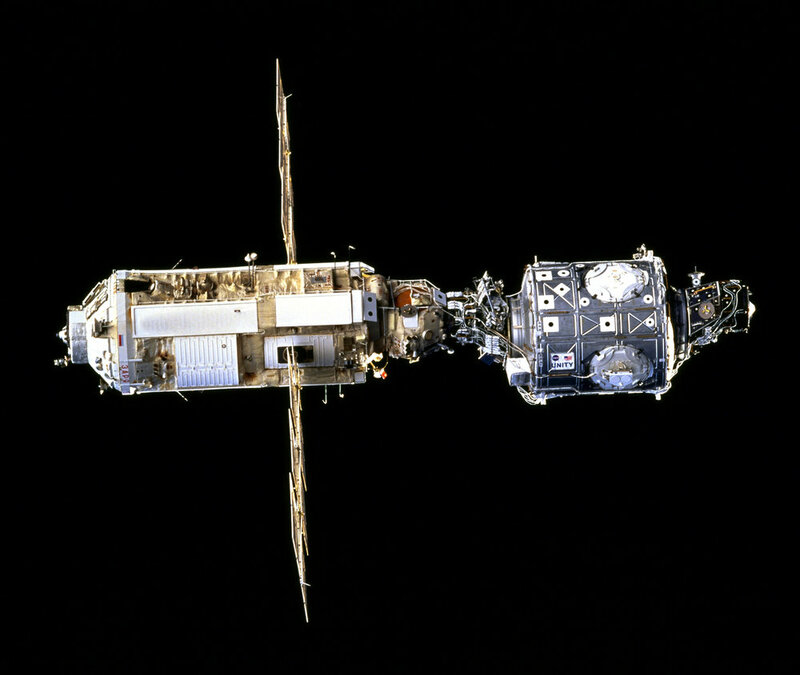 Zarya was initially designed for the Mir space station, but was incorporated into the ISS program in the 1990s when Russia joined the project. Built in Moscow between December 1994 and January 1998, it was primarily financed by the United States. On Dec. 4, two weeks after Zarya was placed into orbit, NASA launched Space Shuttle Endeavour on mission STS-88. Tucked inside the orbiter payload bay was the first addition to the ISS—a node module called Unity. Attached to either end were pressurized mating adapters. It would take two days for Endeavour to reach Zarya. In the meantime, the crew used the robotic Canadarm to remove Unity from the payload bay and attached attach it to the orbiter docking mechanism via Pressurized Mating Adapter 2. Once near Zarya, the robotic arm was used to grab it as well before attaching the module directly to Pressurized Mating Adapter 1. The final connection was made at 2:07 UTC Dec. 7. Several spacewalks would be performed before the hatches between the Shuttle and ISS were opened. That historic opening took place at 19:54 UTC Dec. 10, allowing NASA astronaut Bob Cabana and Russian cosmonaut Sergei Krikalev to become the first two people inside the new ISS. STS-88 would leave the ISS empty on Dec. 13. Over the next two years, several more space shuttle flights would take place to ready the outpost for use. Additionally, two more components would be needed to support full-time occupation—the Zvezda service module in July 2000 and the Z1 truss segment, which provided communication equipment and four control moment gyroscopes for attitude control as well as a temporary location for a giant set of solar arrays, in October 2000. The first crew to occupy the space station, Expedition 1, launched on Oct. 31, 2000, in their Soyuz TM-31 spacecraft atop a Soyuz rocket from Baikonur Cosmodrome and docked with the aft port of Zvezda two days later on Nov. 2. That first crew was ISS commander and NASA astronaut William Shepherd, Russian cosmonaut Yuri Gidzenko and Krikalev, who flew on the first assembly mission in 1998. Since then, there has been an unbroken string of Expeditions with long-duration crew sizes ranging from two to six people. Several times during the space shuttle era, the outpost even played host to as many as 13 people for up to two weeks. 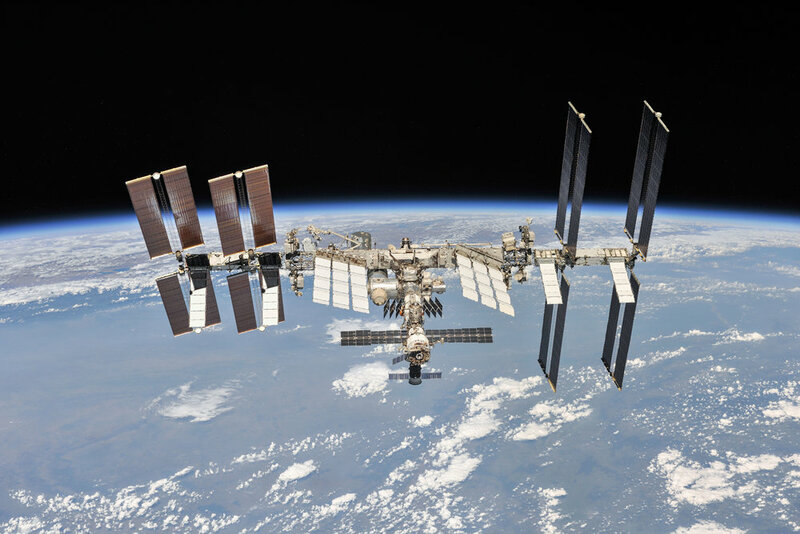 As of 2018, the space station is expected to operate through at least 2024, possibly even 2028 if funding remains and hardware is maintained. For now, the ISS remains beacon for international cooperation and is one of the crowning achievements of human spaceflight. It is paving the way for research breakthroughs in dozens of fields, helping foster a commercial research market in low-Earth orbit, and is laying the groundwork for future human missions beyond low-Earth orbit.